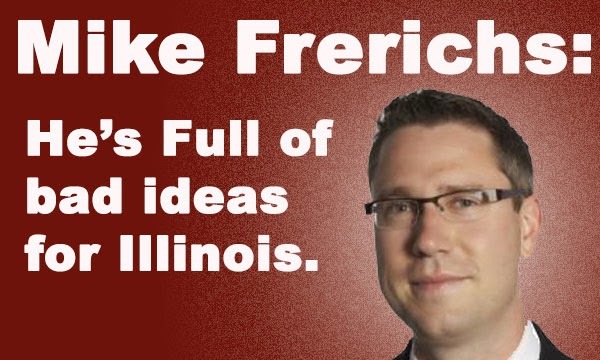 Looks like the fine folks over at WLS Radio might have stumbled upon the new Mike Frerichs for Illinois State Treasurer campaign slogan: "It's Really Stupid" seems to trump "Standing Tall for Illinois", doesn't it? Lauren: Back with Pat Brady, just stumbled on some interesting news. Pat: Yeah, our Treasurer candidate Mike Frerichs, a Democrat, decided as we talk about our friends in Israel getting bombed and attacked, he wants to pull all of our investment, our Illinois investment, out of the state of Israel. It's about $25 million. Lauren: Why doesn't he put that on his campaign slogan? Pat: Yeah that's not going to work so well, I think that's an incredibly bad idea. I think he's runnin' with it. Pat: 24/7, everybody sympathetic to the state of Israel, and one of our candidates announces its a good idea - I don't think its a good idea. Lauren: I'm with you on that.